A couple of posters over at MGoBoard provided screen caps for all. This clearly shows it. The puck's in the net. Game over. They got it right. Thank you Cowbellguy and Skone82. I'm sorry the Frozen Four won't include 5 WCHA teams this year, but Michigan won and it was the correct call. The puck is actually moving toward the goal line in this photo, so even if all the white space between the black blob and black line doesn't convince you, there's absolutely no question that the puck was in the net. If the puck is on the ice, I suppose that's a goal. But if the puck is floating above the goal...it's not a goal. You are dumb. 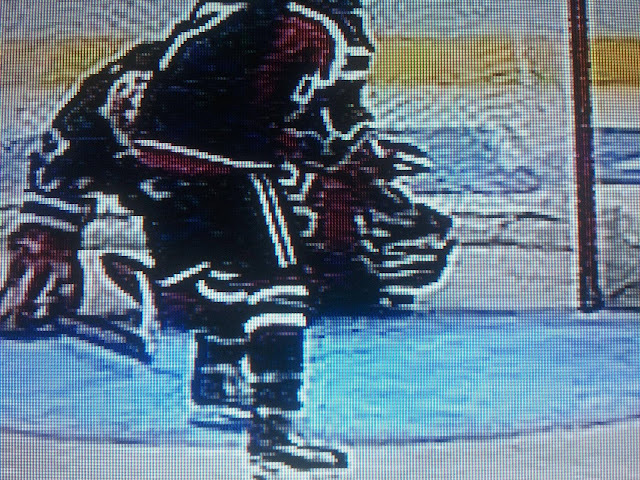 Yes this puck COULD just be floating and that would explain the white space we see between the puck and the red line...Except that its not. If you look at all of the replays and collaborate those observations with this image, there is no way to conceive that the puck was not in the net. I see white ice. Thankfully so did the refs.